Sron na Lairige was the main contract over the summer of 2013. The start was delayed for a while whilst we waited for the last of the snow fields to melt. This was to be a project in 2 phases; 1st phase was the main build on the access slopes to Sron na Lairige, and the 2nd phase was a light touch contract further over the summit on the path leading up to Braeriach. Due to the distances that would need to be covered, this was to be a Remote Accommodation System site. 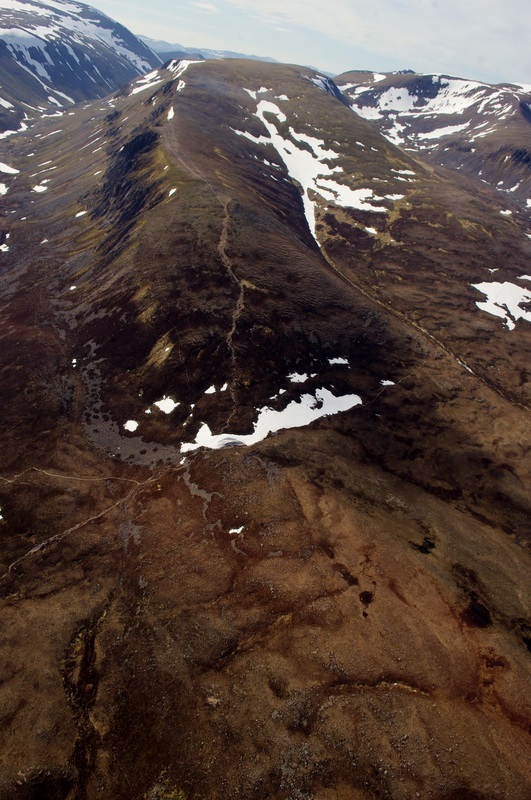 The Sron na Lairige site from the air, clearly showing the huge scar down the centre of the ridge and down near the right hand corner of the central snow field, the R.A.S.